Germany’s 62-Mile Bike Autobahn Connects 10 Cities « Adafruit Industries – Makers, hackers, artists, designers and engineers! What an incredible idea that’s good for both Germans and their natural environment! From FastCoExist. Germany, the country famous for its speed-limit free stretches of Autobahn, is building car-free Autobahns for bikes. The Radschnellweg (“fast bike path”) RS1 runs 62 miles between the cities of Duisburg and Hamm, passing through eight other cities along the way. 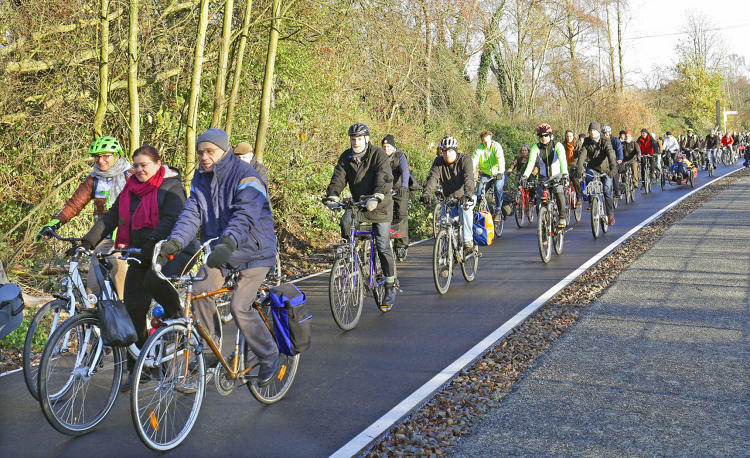 Cycling is big and growing in Germany. In Berlin, the school run is more likely to consist of a parent on a bike with two child seats than in an SUV. Cycling is done for pleasure, but also as just another way to get around. Cities already have extensive cycling infrastructure, and in the countryside, you can find wide, smoothly-paved bike highways.